U.S. Bottled Water Consumption is on the Rise. What Does It Mean? If last year’s bottled water sales are any indication, the sale of bottled water in the U.S. this year will likely surpass that of soda. 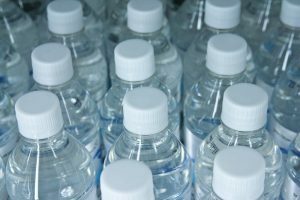 In 2015, Americans bought the equivalent of five bottles of water per citizen each week. Meanwhile, the sale of soda fell 1.5 percent, reaching the lowest level per person since 1985. While there is a positive side to this picture — certainly water is a healthier beverage to consume than sugary carbonated drinks — the consumption of bottled water has negative environmental and economic repercussions, as outlined in Peter Gleick’s 2010 book Bottled and Sold: The Story Behind Our Obsession with Bottled Water. As Gleick explained, each bottle of water is the product of a vast amount of energy and contributes to plastic waste. Given the negative impacts of bottled water consumption, the sale of bottled water has been banned on some college campuses and in national parks ranging from the Grand Canyon to Zion National Park. In 2015, San Francisco joined Concord, Massachusetts in banning the sale of single-use plastic water bottles (however unlike Concord, the San Francisco ban only covers sales on city property). Like bottled water, tap water is a healthy alternative to sugary drinks, and it’s a lot cheaper too. Despite concerns over the quality of water infrastructure in the U.S., tap water is overwhelmingly safe to drink, better monitored and regulated than bottled water, and costs fractions of a penny per glass. In fact, bottled water is about 2,000 times more expensive than tap water. The act of purchasing a bottle of water seems like an inconsequential, isolated choice, yet a vast number of Americans making this choice each day has a significant effect. Efforts to cut bottled water usage are a positive step, but any significant change will involve the widespread commitment of communities, governments, and municipal water providers to provide a safe and reliable domestic water supply; expand access through new, modernized public water fountains; and educate the public about the benefits of drinking tap water. The Pacific Institute is continuing to work on these key priorities. In my opinion, it’s getting hot nowadays.